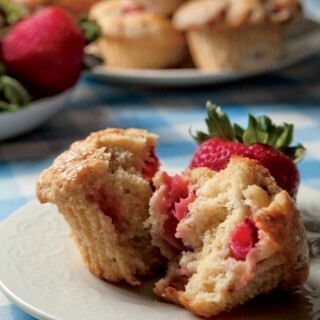 Fresh strawberries star in these easy, half-whole-grain muffins that call for lemon and buttermilk. They’re perfect for Mother’s Day breakfast in bed, weekend brunches or any special breakfast or snack. Nutrition Highlights: Strawberries are loaded with vitamin C and provide nutrients to fight cancer and keep your heart and brain healthy. Preheat oven to 400°F. Arrange oven rack in center position. Coat 12 standard muffin tins with vegetable cooking spray. If using paper baking cups, spray the bottom of each paper cup. Set aside. In a large bowl, whisk together both flours, sugar, baking soda, baking powder and salt. In a medium bowl or glass measuring cup, whisk together egg, buttermilk, oil, applesauce, lemon juice, zest and vanilla extract. Divide batter among 12 muffin cups. Sprinkle with raw sugar. Bake for 18 to 20 minutes, or until a toothpick inserted in center of a muffin comes out clean. Transfer to a wire rack and cool about 5 minutes before removing from pan. Enjoy warm. Nutrition Facts per Serving: Calories – 251, Total Fat – 9.8g, Sodium – 147mg, Total Carbohydrates – 36.9g, Protein – 3.8g **Nutrition information is calculated using an online calorie calculator. Variations may exist. Values are based on a 2,000 calorie diet.